Enjoy the elegance of an ornately styled Chinese blade in minute detail when you display the Chinese Short Sword with Wood Case. Antique black and gold colored scrollwork decorates the hilt and scabbard of this decorative blade. 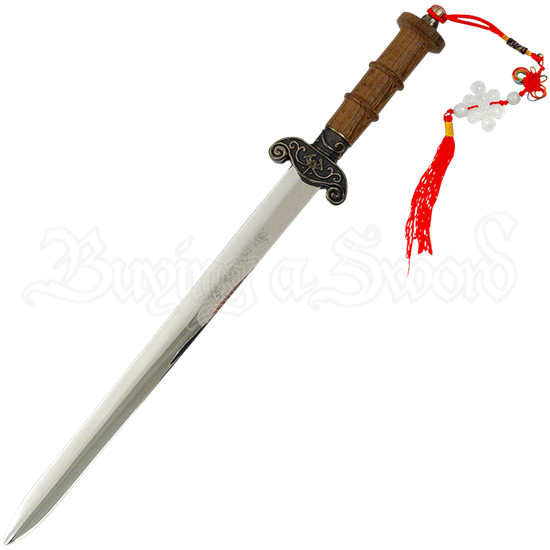 Chinese characters are etched upon the stainless steel blade, adding a sense of authenticity to the decorative swords design. The rounded guard curves upwards, displaying antique gold tone scrolling vines upon a darkened background. Made of wood, the ridged handle ends in a loop, through which is attached a bright red decorative tassel. Place this ornate Chinese sword in its matching scabbard, and display the blade upon a wall using its attached ribbon cord. Or use its included wooden box to showcase or store this unique Asian weapon. Ornately patterned fabric covers the outside of the box while red fabric lines the insides. A fascinating gift or collectible, enjoy the beauty of this miniature Chinese weapon in your home, or gift it to a loved one interested in Chinese culture.